This article first appeared in Enterprise, The Edge Malaysia Weekly, on September 11, 2017 - September 17, 2017. Artificial intelligence (AI) could shake up the medical industry in the near future. As the technology becomes more accessible, AI-powered chatbots and digital assistants will be able to handle a slew of tasks — from scheduling doctors’ visits to providing diagnostic and treatment plans. These were among the key takeaways at the recent Telemedicine Conference 2017. Enterprise caught up with G U Renukanand, director of Veneru Sdn Bhd and one of the principal organisers of the conference, which was held at the Swan Convention Centre in Sunway Medical Centre. “Something as simple as booking an appointment actually results in a lot of wasted time. Imagine if you could now interface with a digital assistant (in the form of an AI-powered chatbot). The booking would be confirmed on the doctor’s schedule and your own. 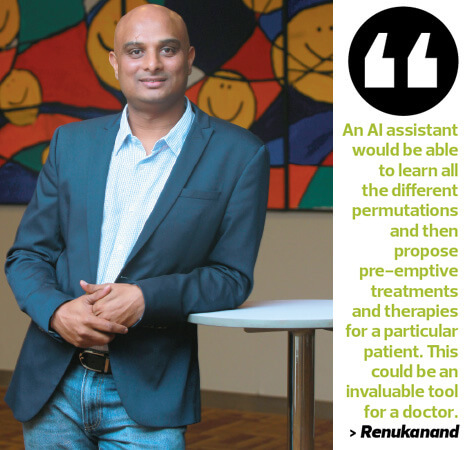 And closer to the date, you and the doctor would receive a reminder,” says Renukanand. In another example, a receptionist can only handle an enquiry at a time, but a digital assistant could field large volumes simultaneously. Such AI applications are able to learn and adapt, so their functionality — and by extension, their value to the doctor — will improve the more they interact with patients. “Can you imagine AI being used to collaborate with doctors? Built into the software’s backend are automated machines that are constantly mining for patient data such as symptoms, medications prescribed, success rates and side effects,” says Renukanand. The Telemedicine Conference was organised by the Telemedicine Development Group, Monash University Malaysia and the Malaysian Communications and Multimedia Commission (MCMC) and sponsored by Collaborative Research in Engineering, Science and Technology (Crest) and Sunway Medical Centre. It was supported by the Ministry of Health (MoH), Malaysian Global Innovation & Creativity Centre (MaGIC), Microsoft (M) Sdn Bhd, IBM Malaysia Sdn Bhd, Cerner Corp and Engineering in Medicine and Biology Society. This year’s conference attracted 350 visitors. There were 21 booths, 15 of which were taken up by university teams. The rest were taken by MoH, MCMC and the private sector. A major highlight of the conference was the Telemedicine Innovation Challenge (TIC). A key part of the conference series thus far, it was a platform for innovators to present ideas and proofs-of-concept to a panel of distinguished judges. Tay Ee Lin, a PhD candidate at Monash University Malaysia, was a member of the organising committee and responsible for spearheading the TIC. She says the platform was a great opportunity for teams to present ideas related to e-health innovation. The competition was open to students, industry players and start-ups. This year, there were 14 teams presenting various ideas across three focus areas — aged care, chronic disease management and wellness and health. “We split them into two categories, namely Innovative e-Health Solution and Impactful e-Health Solution,” says Tay. She says the judges were carefully selected and consisted of experienced medical doctors, industry players, leaders of medical associations and senior personnel of MoH and MCMC. Hyperlab is a local company leading the way in natural language processing and machine-learning capabilities. The outfit has successfully deployed a host of AI-centric services and chatbots for the banking and telecommunications industries. A system like this could work well in the medical equipment sub-sector. “The second part has to do with following up with the doctor. We can deploy a chatbot with the ability to remind customers of their booking details. And it can do so either from a messaging system or right out of the booking app the customer uses,” says Greenough. He adds that Hyperlab’s strategic advantage lies in its ability to be flexible with the technology and bring a finished product to market faster than the larger players. “We build platforms from scratch. So, unlike others who use proprietary AI systems from other providers, we provide both the AI capabilities and the final product. According to Greenough, with the Asian market’s gradual demand for AI and its associated applications, Hyperlab is expected to continue focusing on players in the business-to-business segment. Babylon Health has launched a subscription-based service that offers medical AI consultations based on personal medical histories and common medical knowledge. A user reports his symptoms using the app, which checks them against its database of diseases using speech recognition software. After acquiring more data from the user, Babylon Health offers several courses of action. The user gets to schedule video consultations and chats with healthcare professionals right from the app. The app also reminds patients to take their medication and follows up on their symptoms. The power of AI technology here means that diagnosing a patient is now more efficient while waiting times at the doctor’s office are considerably reduced. Babylon Health secured US$60 million in funding in April. News reports value the health and AI start-up at about US$250 million. 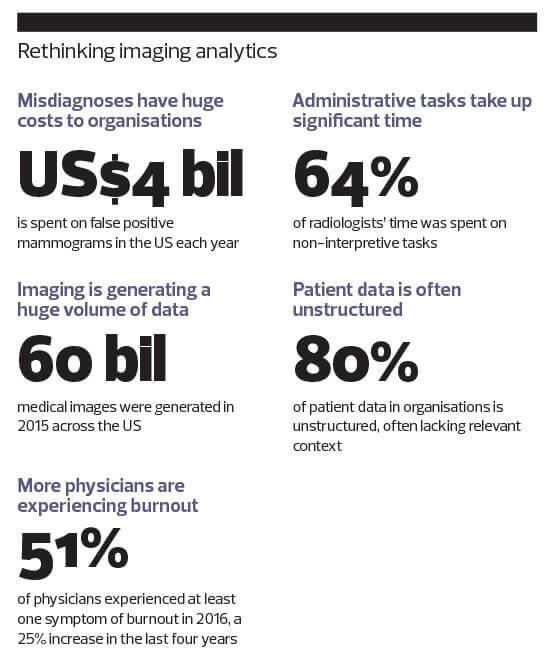 Data management in medicine is particularly ripe for disruption. Predictive modelling of processes and medication could hit critical mass as vast amounts of molecular and clinical data are now open to being churned by medical AI protocols. The ability to make sense of huge volumes of data quickly could help identify new and effective drugs with a high probability of success. Such advancements could help drive down the high cost of research and development. With AI involved in the data mining process, another big contributor to the high cost of manufacturing drugs — clinical trials — could be open to disruption. Patients can now be enrolled into trials based on more sources than just doctor visits. Social media data mining, for example, or taking into account factors like genetic information could result in far more targeted candidates as well as shorter, cheaper and more potent clinical trials. Thanks to AI, subjects in clinical trials could be monitored in real time to quickly identify safety and operational signals so as to avoid costly or even dangerous side effects or delays. The Telemedicine Conference 2017 was an early proving ground for a host of new technology providers, from institutions of higher learning as well as private companies. Take OCO co-founders Chong Jen Ping and Poh Wencuan, who are working as software developers in Penang. 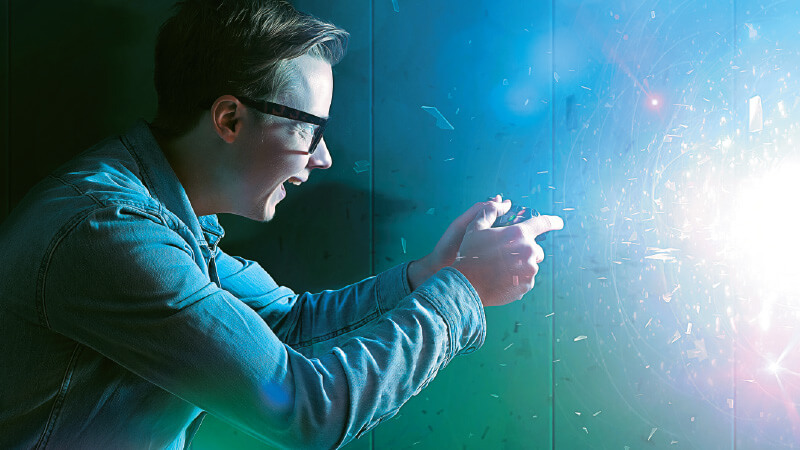 They joined forces to develop a new software that could potentially screen for a variety of optical deficiencies as well as provide corrective therapy by means of a smartphone-compatible 3D game technology. Although the technology is in its infancy, Chong and Poh won first prize in the Impactful e-Health Solution category at the Telemedicine Innovation Challenge. Their next major challenge is to have their invention subject to clinical trials, after which the data undergoes peer review before it can be deemed suitable for commercialisation. For the time being, however, the duo and their mentor Dr Chew Cheng Hoon, who is with the Ministry of Health’s Clinical Research Centre, are cautiously optimistic about the prospects of the technology. It all started when Poh and Chong — long-time lunch buddies — began trading notes on gaming consoles. Being avid gamers, their lunch hour would consist of conversations about the latest game releases. One day, Poh brought his favourite Nintendo 3DS handheld console, which has the ability to generate gaming content in 3D, for his friend to look at. It would be the first time Chong saw something in 3D as he suffers from a condition known as stereoblindness (the inability to see in 3D), which results in severely impaired depth perception. Needless to say, this can be debilitating if left uncorrected. He wears glasses, but says it does not fully correct the problem. The breakthrough moment inspired Chong to come up with the idea behind OCO. And he had the perfect partner in his software developer colleague and lunch buddy Poh. The OCO system is a combination of screening for optical deficiencies (currently, they are screening only for stereoblindness) and 3D games that serve as a form of corrective therapy for patients. The duo co-developed a software that runs a series of images to screen for optical deficiencies and therapeutic games that can be played on any 3D-compatible smartphone. “The idea is to bring vision therapy home so people can do it at their own pace and in their own time. We wanted to make the therapy fun and entertaining becuse we want to increase the levels of compliance associated with corrective therapy for stereoblindness,” says Chong. According to Chew, stereoblindness is typically diagnosed in schoolgoing children and the current standard therapy — a corrective eyepatch — is less than effective, to say the least. “Most of the patients are diagnosed when they are in school. For the corrective eyepatch to be effective, it must be worn four to six hours a day,” she says. While the technology may seem promising, the co-founders readily admit that they “at least a few years” away from commercialisation. “The clinical trials will determine if our system is more effective than the corrective eyepatch. And even then, it will be some time before the 3D games are polished enough to be released with the software,” says Poh. The machines may have not got their axles on the nuclear launch codes, but it is probably best not to introduce IBM’s new cognitive intelligence — amusingly named Watson — to the Terminator franchise just yet. Watson is the culmination of years of cutting-edge research and billions of dollars spent by the technology giant. The investment has paid off and IBM has created a cloud-based cognitive intelligence capable of learning from its environment, interacting with people by means of singularly unique responses and even teaching and assisting healthcare professionals. Watson has the processing power to make sense of unprecedented amounts of unstructured medical information — digitised doctor’s notes, X-ray images, CT scans, hospital records, anonymised patient data, chemical reactions and drug side effects. It then trawls through the data and calculates treatment options and optimal therapy plans for doctors to use or customise. For the moment, this multibillion dollar bit of programming wizardry is capturing the imagination, along with literally terabytes of structured and unstructured data. However, whether this prompts Watson to gain self-awareness, cast off its programming shackles and enslave us all remains to be seen. Enterprise speaks with IBM Malaysia client technical adviser Lee Yu Kit about the applications and implications of this technology. He assuages any fears of a machine uprising and says Watson has been busy saving lives for a number of years now. “One of the products we have is called Watson for Oncology. 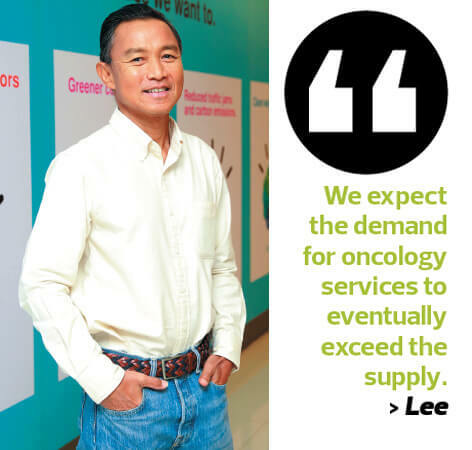 We expect the demand for oncology services to eventually exceed the supply. So, we have basically trained Watson to be able to treat cancer,” says Lee. According to Lee, Watson was first “trained” by the experts at Memorial Sloan Kettering Cancer Center, a specialist cancer centre in the US. “So, all the other hospitals that have acquired Watson for Oncology have actually gained from the expertise of Memorial Sloan Kettering, and some of the hospitals have customised it even further,” he says. This is groundbreaking stuff, but the true litmus test lies in Watson’s ability to mirror the treatment options of its human counterparts. So, just how concordant is Watson to the generally accepted treatment standards for cancer? According to the IBM literature, Watson for Oncology was deployed at the Manipal Comprehensive Cancer Centre in Bangalore, India. 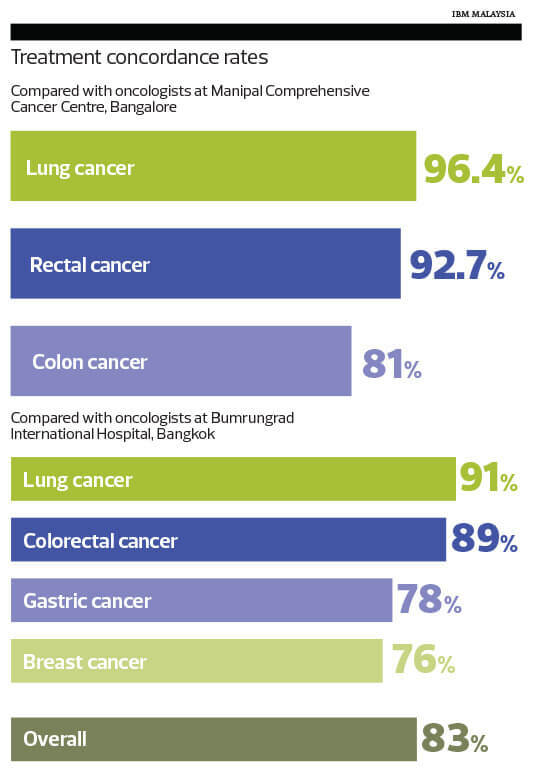 It matched the centre’s multidisciplinary tumour board’s treatment recommendations in 96% of its lung cancer cases. Watson also scored 93% concordance with rectal cancer cases and 81% with colon cancer cases, compared with the recommendations of the hospital’s tumour board. In other cancer centres around the world, Watson for Oncology was again largely consistent with the recommendations of those oncologists and healthcare professionals.